Pray For Carhart: Daddy, What's Abortion? I dread the day when my daughter is going to ask me... "Daddy, what's abortion?" I know the day is quickly approaching. My daughter just turned 5 and is reading more and more each day. I'm not looking forward to the day when we go out to "pray for babies" and she sounds out the word... a-b-o-r-t-i-o-n on the signs we are holding. 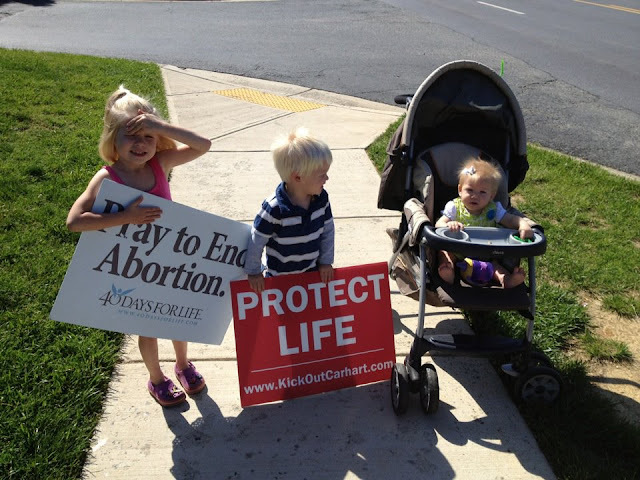 As the campaign director for a 40 Days for Life, I am on the street quite often praying for an end to abortion. The signs we hold up read "Pray to End Abortion" and I am dreading the day I have to explain to my sweet, innocent daughter what exactly is involved with abortion. Sure, I will probably sugar coat it and try and change the subject... but the day will come when I will look into her beautiful eyes and see her world crashing down around her as she comes to realize what is happening in the building behind us as we stand on the sidewalk and "pray for babies." Her days of princesses, fairies, and nothing wrong in the world will disappear forever. I am dreading that day! How can a little child comprehend that a mother would want to end the life of her baby? How can a 30-something year old comprehend that a mother would want to end the life of her baby? But it happens... and it happens dozens of times less than 1 mile from our house every single week. Less than 1 mile from where my daughter plays with her toys, and her only worry in the world is "what can I have for dessert," unborn children are ripped apart and thrown into the trash. Kids that would one day go to her school, be her friends... are being thrown in the trash like garbage. How am I supposed to tell this to my daughter? How can she live with knowing this fact? How do I live... knowing this fact? How does everyone in my neighborhood live... knowing this is happening? Some know about it and stand on the corner and pray. Some know about it and don't want to get involved in someone else's "choice." Some celebrate the fact that women are able to end the lives of their unborn children. Please... how am I supposed to tell my daughter about this? My family and I have the "privilege" of living next to an abortion clinic that performs second and third trimester abortions. These are abortions that are well past the point of viability. These unborn children are capable of living outside of their mothers womb! These are not a "clump of cells," they are fully formed, healthy, viable children. But the abortionist believes these women are in a desperate enough situation to make it okay for them to end the life of their child. When my daughter realizes these babies... many of them bigger than the baby dolls she plays with at home... are being ripped to pieces, having their heads crushed and thrown in the trash, it is going to break her heart. How is she supposed to live with that burden. How do we live with this burden? How do we so callously push the thought out of our minds and think about something else? The pro-choice crowd wants me to tell my daughter "abortion makes you strong," "abortion is your god-given right," and "without abortion you would not be free." My daughter and any other child will see through these lies. How in the world does killing your defenseless, unborn child make you strong? How does it set you free? Paying someone to rip your child apart is the opposite of "strong," "right" or "free." Abortion is degrading and belittling to women. Even a little child can see that. I want my daughter to know that no matter how desperate the situation is... how hopeless it seems... women are strong and deserve better than abortion. When my daughter thinks back to the time mommy and daddy were talking to a lady with a large belly walking towards the building where we "pray for babies. ;" when she remembers mommy and daddy offering the woman anything that she needed; when she remembers mommy and daddy offered to adopt the woman's baby and make him her new baby brother; when she remembers mommy and daddy getting into the car and crying because the woman with the large belly went into the building; when she realizes that this women paid someone thousands of dollars to kill her unborn child... my daughters world is going to come crashing down. I dread this day. I dread this day just like I do the days when clearly pregnant women go into that building. It breaks my heart... and it breaks my heart just now thinking about that moment when I have to explain... really explain to my daughter what abortion is... what late-term abortion is. When my daughter does realize what abortion is... what it really is... I hope that she will ask me... "what have you done about this?" I hope I can tell her I did everything I could. Everything I could to offer the women in these desperate situations hope. Everything I could to stand up against this evil. I want to be able to tell her I did not sit idly by while these children were being ripped to pieces and thrown in the trash.